I have this P4 I got for super cheap in Hong Kong, that came with Windows 98 of all things. Naturally I want to load something more useful like Windows NT 3.1 onto it, so I did have to do some tweaking first. The first thing is the hard disk. 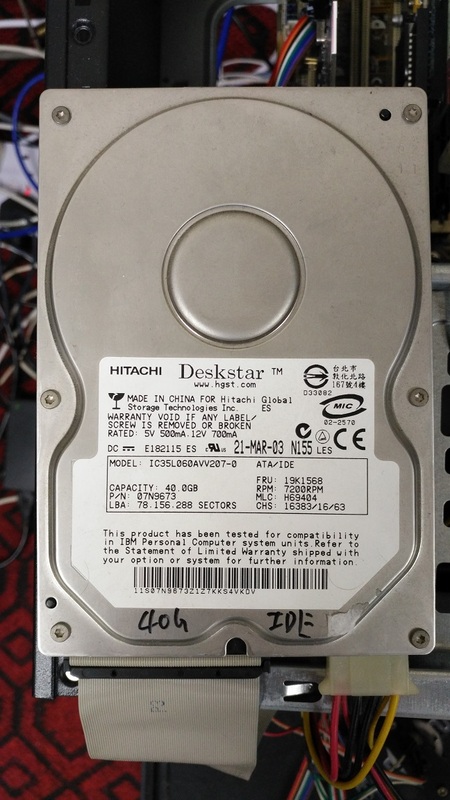 I was lucky in that this machine came with a 40GB disk, the Hitachi Desktar IC35L060AVV207-0. Now what makes this disk great, is that it can be jumpered down to act like an 8GB disk, so that things like MS-DOS and older OS’s like Windows NT can recognize the disk. Even nicer that the jumper settings are on the disk! My board supports booting from IDE, which is nice as I could paritition and format the disk from MS-DOS 5.00, and make sure things were working fine. However it really doesn’t matter as over on Beta Archive, The has made an ATAPI driver available for not only Windows NT 3.1, but also various beta versions as well! You can find the post, and the links to download here! (mirror here). Now you can install from the boot diskette & a driver diskette and load the rest of the OS from CD-ROM. You will have patch the INITIAL.IN_ and SETUP.IN_ files to allow installation on any new processor. You can leave the files expanded, but this is needed if your CPU is newer than a Pentium (Yes a Pentium 60/66 type processor, so that is Pentium Pro, Pentium II, Pentium III, Pentium 4 and beyond…). But yes, this is great! 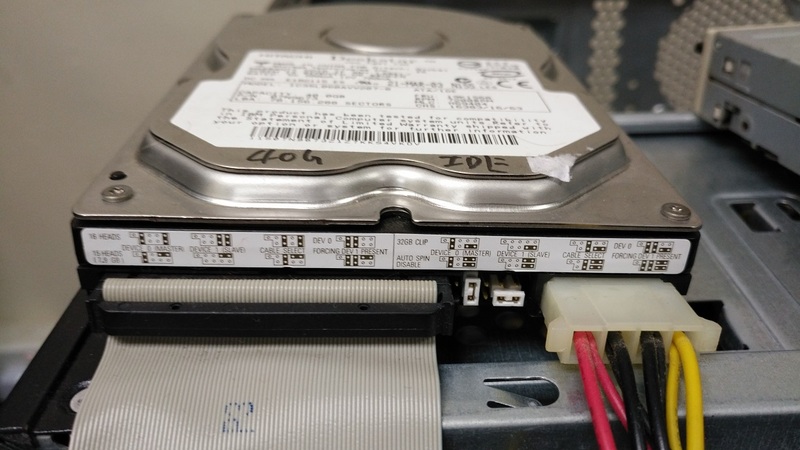 No need to try to dig up old SCSI cards, SCSI disks, and SCSI CD-ROM drives. 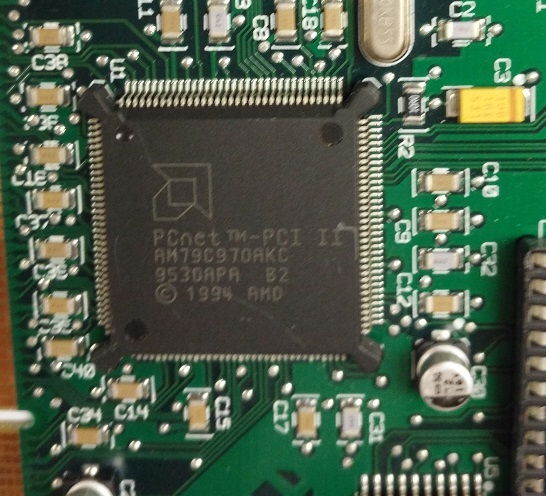 And much like Qemu and VMware, the AMD PCnet is a great go to PCI card, and I was able to find this IBM 11H8130 Type 8-Z 10BaseT PCI Network Card which works! The card works great with 11265315.exe set of drivers, OR disk image pcnet.7z . But for sure the key is the in the chipset! As this chipset, the AMD AM79C970AKC is the one that is explicitly listed as compatible. 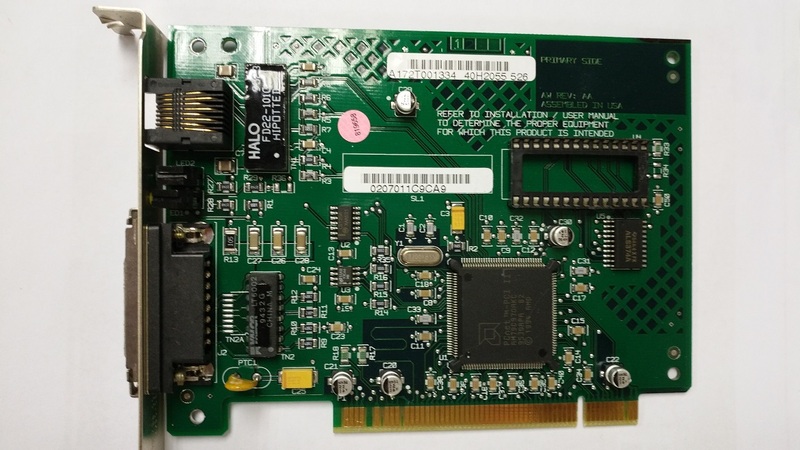 This IBM card provides an AUI port, along with a 10baseT port. Of course when installing Windows NT 3.1, you’ll want service pack 3, the last update to the OS. Also don’t forget to replace NTLDR & NTDETECT.COM from a later version of Windows NT to allow access to more than 64MB of RAM. Windows NT 3.1 will allow you to install on FAT, HPFS, and NTFS v1 partitions and disks. The TCP/IP is a 3rd party, from Spider that does not support DHCP. Outside of doing it just because, it really is better to go with NT 3.5 or 3.51 as they have better SMP support, are much faster, and have a much more robust network stack. Yes it’s real! For those who don’t remember history, after the Net/2 release there was a company called Berkeley Software Design Inc (BSDi) that provided a commercial port of Net/2 that also included source. Add in the infamous 1-800-ITS-UNIX ad, and as they say the rest is history. During this time frame it does get hard to track down as the name was in constant flux. 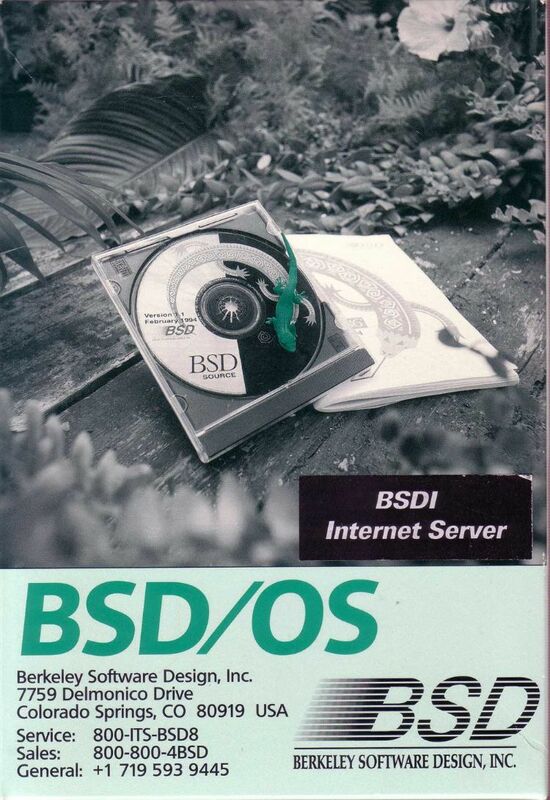 BSDI, BSDi, BSD/OS, Internet Server… Mix in the fun with 386BSD and you get all around naming confusion.  One can only hope that 0.3.1 from the apparent “300 customers” may eventually surface. For anyone who want’s to relive the glory days, there is a qcow2 disk image suitable for Qemu floating around.. 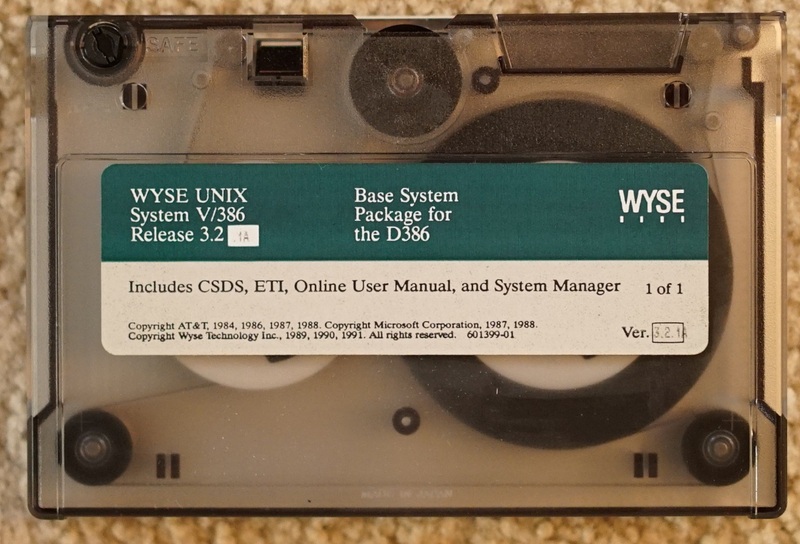 The subject is the rarest of the rare WYSE Unix! The next step is yours! Install the whole system on to a hypervisor of your choice, document the process and supply a vanilla boot image or VM. The winner shall be the person who will first post a comment declaring success including a screenshot and can further prove it by emailing emailing me the submission shortly after. If the comment gets blocked by spam filter, don’t worry the original submission time will of course count. Oh and almost forgot: I also need aclock binary for it, however if there is no compiler and the standard SysV binary works fine, you are exempt from the requirement. The catch? Looks like floppy disk trouble. The boot disk is fine after it has been fixed up by Michal. 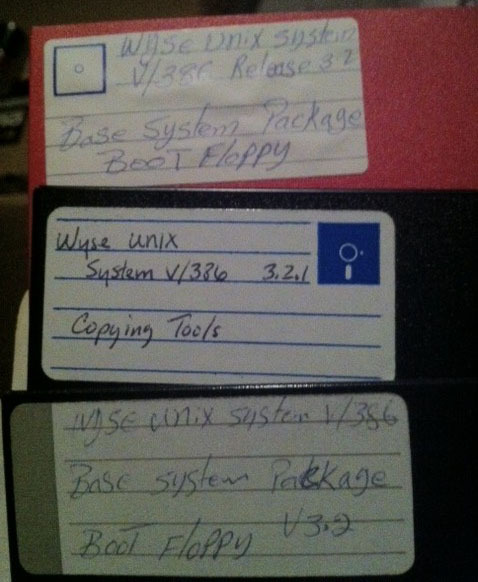 The Base floppy looks like has same content as boot. Copy Tools is very small. Looks like it may be truncated. Hopefully not, but if yes I count on your creativity. Remember that Dell Unix is an exactly save release of SystemV/386 and did not have or needed copy tools to install. Update: Looks like the contest has been won by Mihai! Congratulations! Well from popular request I finally got around to loading this up. I went ahead with my favourite retro emulator, PCem for this, as it can nicely emulate an EGA display, unlike most emulators which do VGA, however when it comes to older versions of Microsoft products they really can detect the difference between EGA and VGA. So to start off, I downloaded from the project page, this version of PCem, compiled it, and installed MS-DOS 4.01 , from April of 1989. The Windows 3.0 Debug Release 1.14 itself is dated from February 22nd, 1989. Which I figured is close enough to the time period. I’m using the 486SX2/50 because I’m too impatient for the 386 speeds, but it does work fine on 386 or higher emulators. It does NOT work with any 286 emulation. I’m also using the HIMEM.SYS from MS-DOS 4.01 vs the one with the Windows 3.0 (Alpha? Beta? Technical Preview?) since it is slightly newer. Look at all the memory! 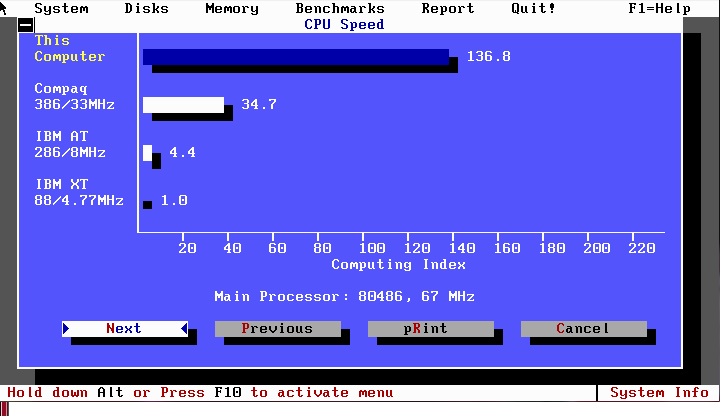 And first thing to notice is that on my setup with 8MB of ram, I have over 6MB of RAM free. 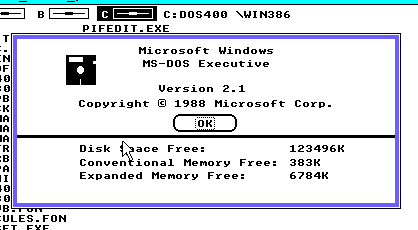 Compare this to regular Windows 2.1 which gives me 399Kb of ram in my current setup. 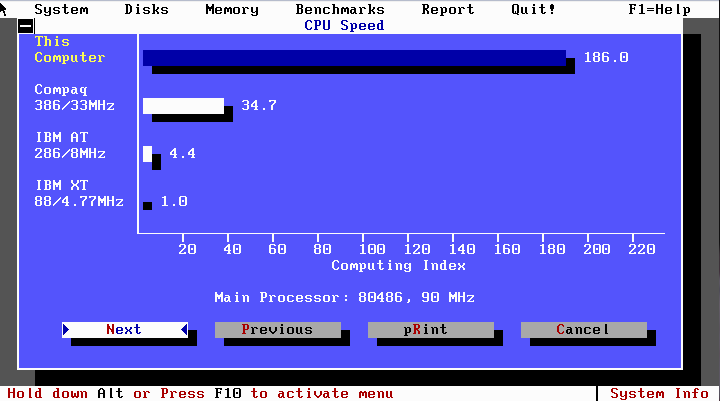 And with Windows/386 Version 2.1 it provides 383Kb of real memory, along with 6.7MB of EMS memory, as the Windows/386 Hypervisor includes EMS emulation. Of course the major limitation of Windows 2 is that it runs in real mode, or in the case of Windows/386 an 8086VM. As I mentioned a while back in a post about Windows 3.0, This was game changing. As now with Windows running in protected mode, all the memory in my PC is available to Windows, and I am using MS-DOS, with nothing special. Besides the limitation of being EGA only, the Debug version of 3.0 is that there is no support for MS-DOS applications, as WINOLDAP.MOD is missing. This is clearly an interim build of Windows 3.0 as mentioned in Murray Sargent’s MSDN blog Saving Windows from the OS/2 Bulldozer. As mentioned from the article they began their work in the summer of 1988, so considering this is early 1989 it shows just how much progress they had made in getting Windows 2 to run in protected mode. Along with Larry Osterman’s MSDN blog post Farewell to one of the great ones, which details how the Windows 3.0 skunkworks project was writing the new improved 386 hypervisor, and how Windows 3.0 got the green light, and changed the direction of not only Microsoft but the entire software industry. I’ve been able to run most of the Windows 2.1 applets, however I’ve not been able to run Excel 2, or Word 1. I suspect at this point that only small memory model stuff from Windows 1 or 2 is capable of running. Although at the same time, when 3.0 did ship, you really needed updated versions of Word 2 and Excel 3 to operate correctly. The applets from Windows 2.1 seem to work a LOT better than the one from Windows/386 2.1 if that helps any. This is an interesting peek at an exceptionally early build of Microsoft Windows. Thanks to HalfMinute, SA1988 and Battler for contributions towards this release. Poorly translated from TAKEDA toshiya’s blog.. I has integrated source of i386 and i286 edition edition. In addition, in the i286 version, I added support for int 10h/16h. 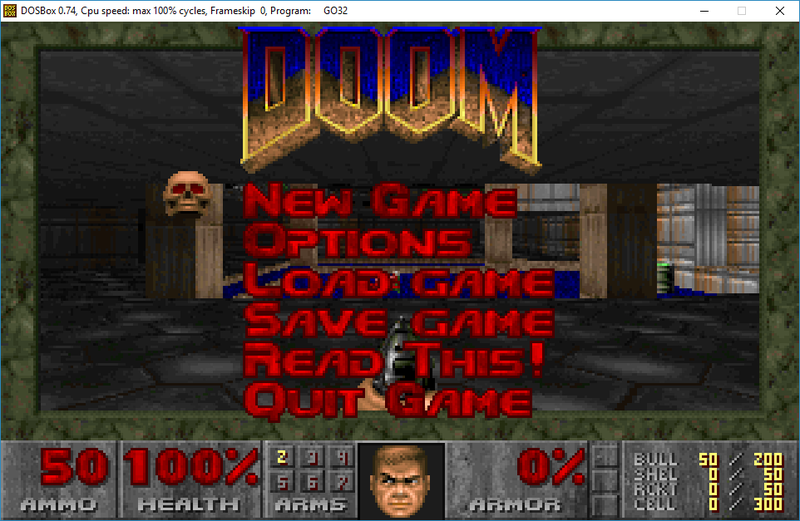 equivalent to 0.149 MAME, I was replaced with a 0.152 equivalent MAME core i386 i286 core. 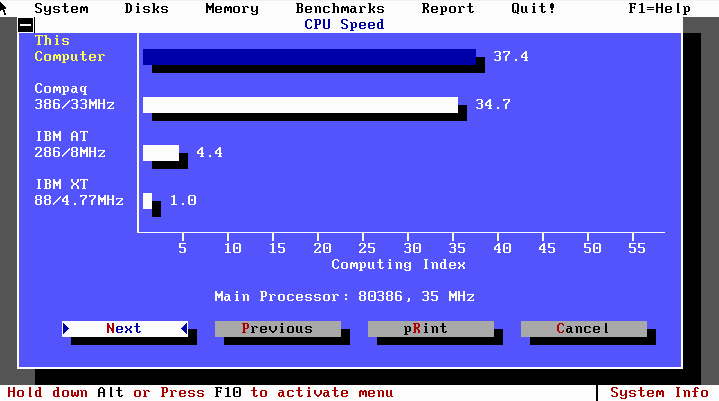 However, the i386 core, I have omit the TLB around. Which is very cool, although I wasn’t sure about the MAME source code being open to other projects…? I tried to contact the i86/i386 author vlinde but he then pulled his contact page. I wanted to use i386 for something of my own, but the whole “Redistributions may not be sold, nor may they be used in a commercial product or activity.” really puts the damper on it. I was able to get some simple XMS test program to run, but nothing of any substance. No DOS4G/W or anything like that. 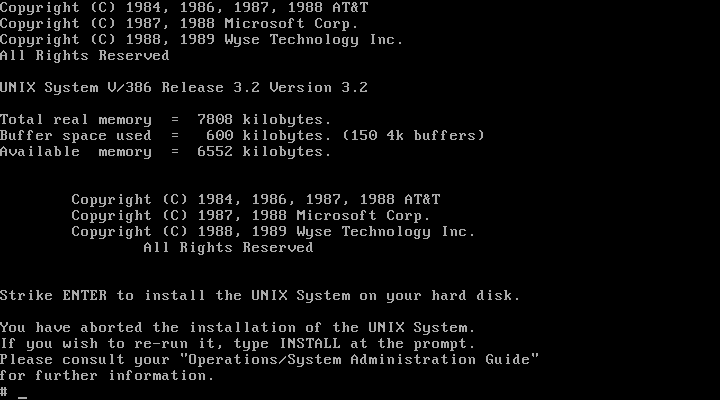 But if you re-build it specifying MS-DOS version 5.0, some of the MS-DOS utils and even command.com work! The weird issue I had was running out of conventional RAM, because this program gives you nearly 1MB of conventional RAM… I was surprised, as I wasn’t expecting that much! 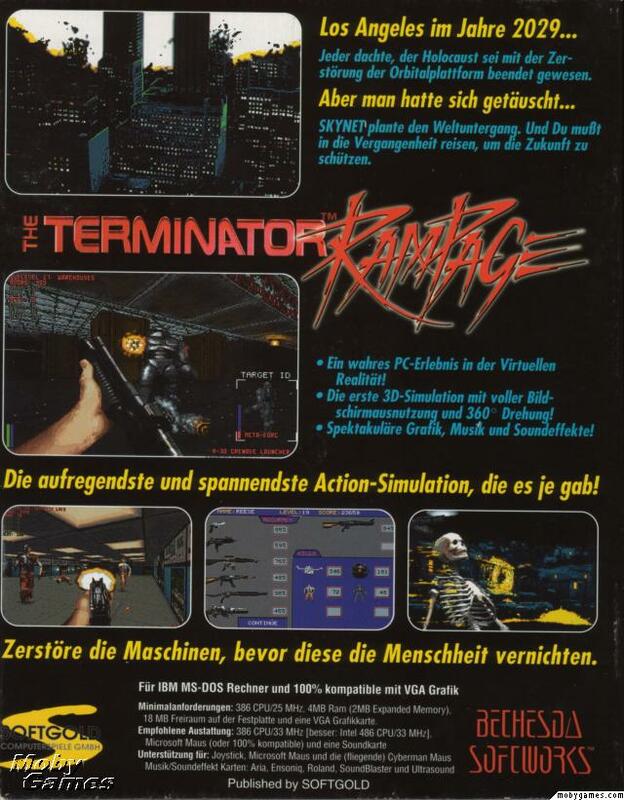 Back in October of 1993, this cool looking game, The Terminator Rampage was released. But sadly I had a lowly 4MB 386sx-16 with CGA, so things like this game with it’s awesome VGA graphics were an impossibility. 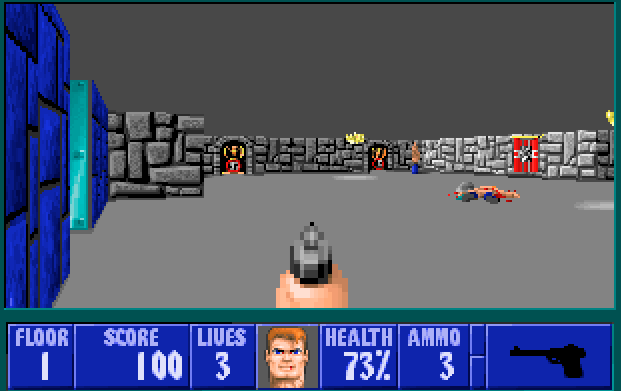 Even more sad at the time was that ‘primitive’ 3d games like wolfenstein 3d also required VGA. But as we all know a few short months later, DOOM was released, and then Terminator Rampage was quickly swept off the face of the earth. So I was thinking Qemu could easily run this game. Long story short, it doesn’t work. Turns out Rampage needs EMS. And for whatever reasons, running emm386.exe on Qemu (I tried a handful of versions) just crash on Qemu after initialization. Failing with stock Microsoft EMM386, I tried JEMM, which loaded, and ran it’s built in EMS diagnostics OK, but trying to run Rampage resulted in a nice crash. 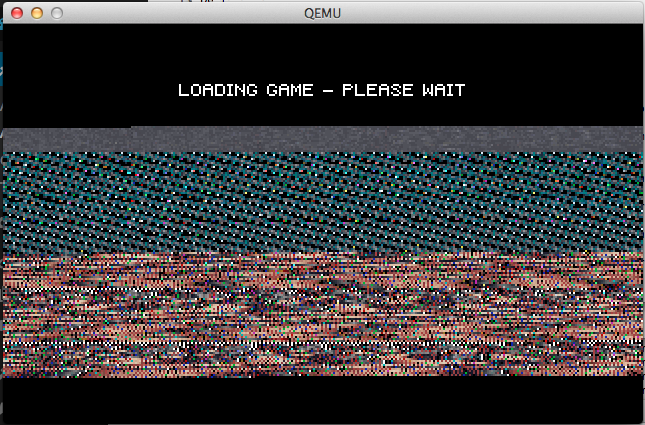 So giving up on Qemu, I tried it on DOSBox. It runs but it is incredibly jerky. So I thought I’d try PCem, and see how it runs there. 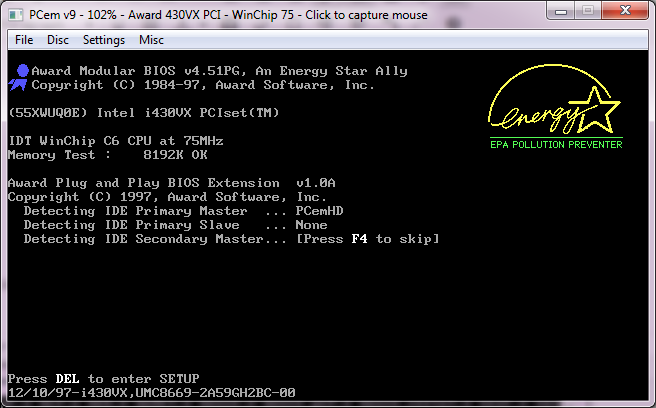 So the plus side is that PCem, is able to run MS-DOS & EMM386.EXE without issues. It only took a few minutes to install MS-DOS 5.0 and Rampage on my ‘virtual’ 486DX2/66 with 8MB, of ram, and load up Rampage to be greeted with it’s jerky motion. Thinking its something with emulation in general I fire up Norton SI to get some PCem scores how it benches against known good samples. They really thought this would be playable on a 486 @ 33Mhz. So how does it choke? While going straight is ‘ok’ turning around is so utterly sluggish that there is no feeling of immersion. It feels like you are driving an incredibly slow tank. At the same time, the more realistic sprites, and textures serve to make it look even more unrealistic. 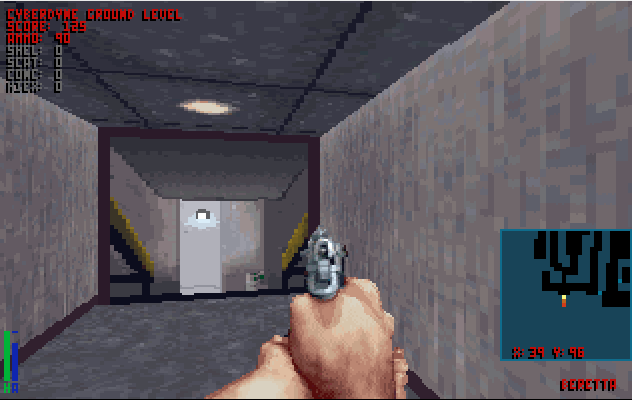 Well here is a screenshot of Wolfenstein 3d on the 386DX-33 (and more than playable). As you can see, there is no ceiling, and no floor textures. 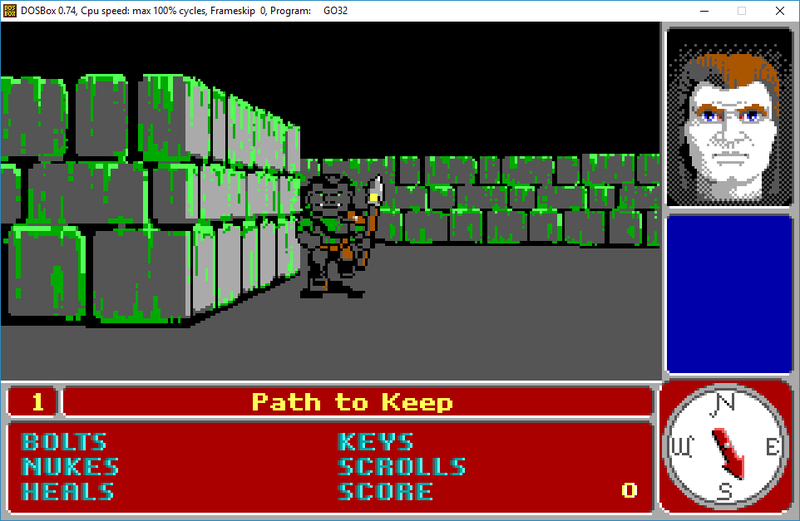 The walls are all uniform height, and the textures were clearly drawn by hand, giving it a very fake and ’16bit’ feeling. I should also add on a capable 286, this game is playable. Now at first it looks like it has a lot in common with the soon to be release DOOM, with textured ceilings and floors. 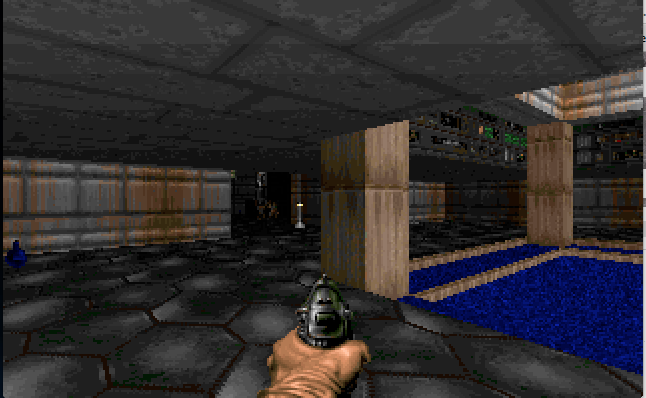 Now as you can see the difference in DOOM is the 2.5D effect of there being lower areas so you can go up and down stairs (while you cannot go under them). 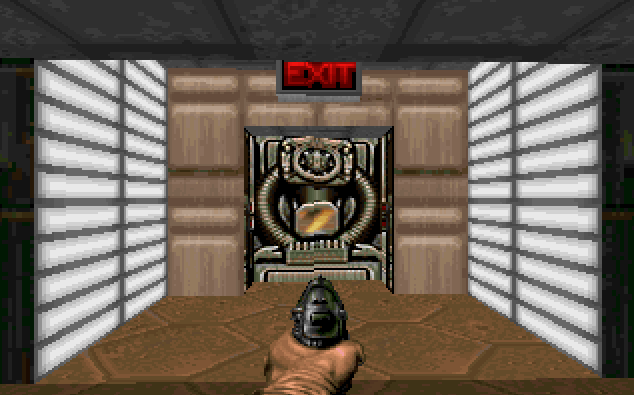 Also Doom introduces dynamic lighting, and better sound rendering. While I do like Rampage’s upfront map, as you can see thought, it is very square. 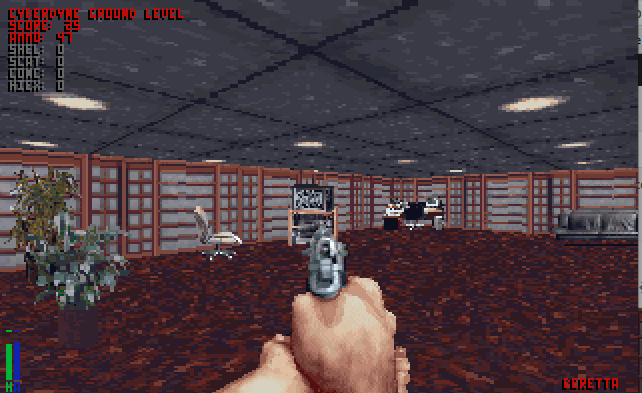 In a small effort to ‘speed’ up Rampage you can turn off the ceilings and floors revealing a very Wolf3d like environment. Unfortunately the more they tried to give the world detail, the more it well just looks flat. Which kind of kills the whole thing. Maybe they should have left out things like water fountains. Then you get things like this computer setup (one of the programmers? The accountant’s lamp is a nice touch) but it’s a sprite, so as you rotate around it, you always see the same face. 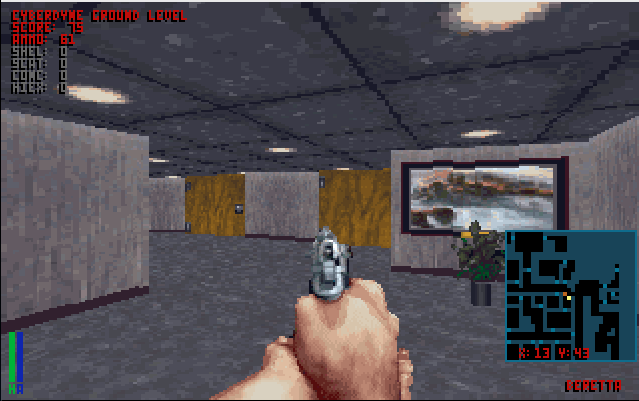 Ironically it’s these high resolution background sprites that make the environment feel less real, as they make the rooms feel too open, and too sparse. 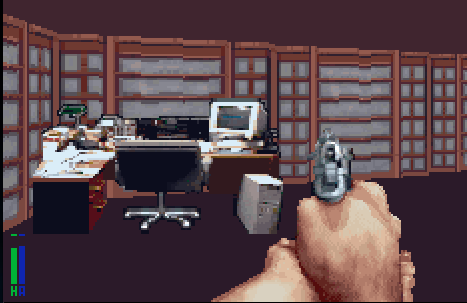 It is the real paradox that in a good shooter you have lots of room, and things to duck behind, but the rooms feel too large, and look bizarre with the massive open spaces. 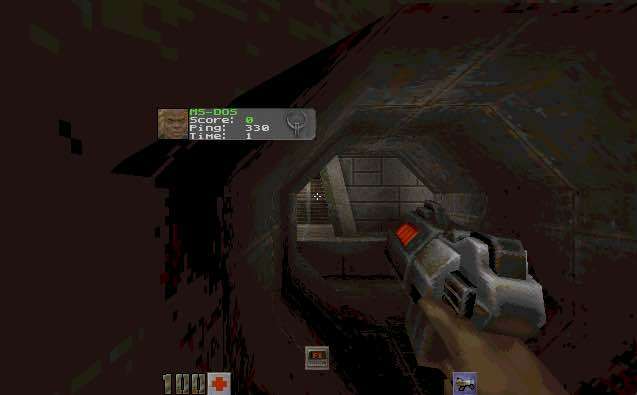 But it is more so a limitation of the time, with the engine being more of an improved Wolf3d engine, than taking a larger leap into being something more 2.5d or 3d like Doom (or the distant Quake). Another thing that really bugged me was the doors. 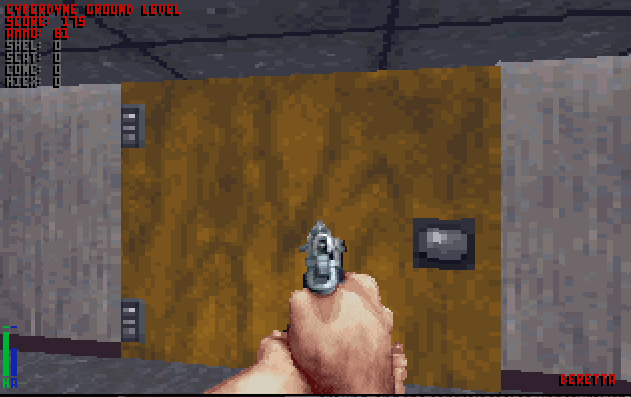 In doom, the doors felt more ‘natural’ in that they weren’t super wide. But in rampage they are stretched wide giving the impression of why you can’t turn is you are incredibly wide.. Even the ‘exit’ door texture still feels too wide. 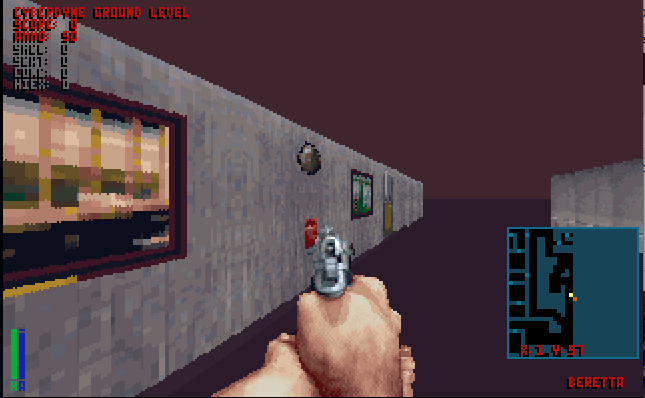 I could probably get by the empty spaces, but it takes so long to turn around, and the controls feel so unnatural (they don’t even try to be a Wolf3d control-a-like) that it really feels klunky. No matter what speed you play it at. It really was an exercise in frustration. 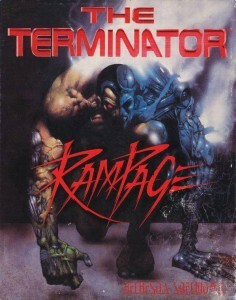 Author neozeedPosted on April 28, 2014 Categories games, i386, MS-DOS, pcemLeave a comment on Terminator Rampage.